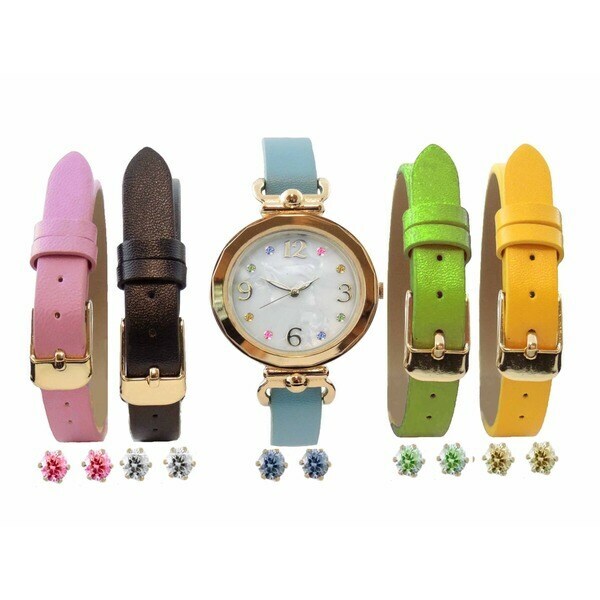 Designer inspired interchangeable women's watch set featuring real mother of pearl and cubic zirconia dial, 5 pairs of cubic zirconia earrings, five interchangeable faux leather bands is perfect for that special lady in your life. My partner and I met at college and after getting to know about each other's talents and passions, we decided to take the entrepreneurial path. We traveled to Switzerland and China to seek out quality components at affordable prices to use in our line of watches and jewelry. Eventually we transitioned from store front retail to wholesale and online retail. It has been an exciting transition and two children later, we are still passionate about each other and providing quality accessories at affordable prices to our customers. Dimensions 7.0 In. X 3.0 In. X 1.0 In.